A rookie and two 40-year-olds combined to hold the Pirates to three hits on Monday night. What oh what has happened to that Lumber Company revival from a few weeks ago? Cincy's Travis Wood, making his sixth career MLB start, never allowed a Pirate past second base, turning over a 3-0 Reds lead to 41-year-old Russ Springer and 40-year-old Arthur Rhodes for the final two innings. 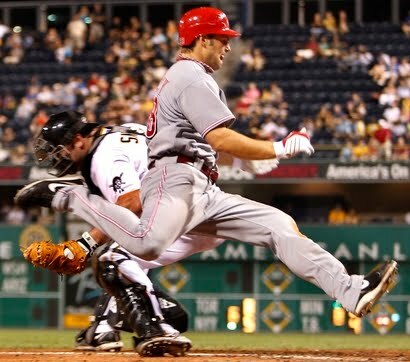 Toss in an inside the park home run from the Reds' Chris Heisey (only the 2nd in PNC Park history), and you've got the recipe for a 4-0 Cincinnati win before a morose announced crowd of 15,000 and change on Monday night. It doesn't take much offense to beat the Pirates, as Ross Ohlendorf knows all too well. Monday was the fourth time that the Bucs were shut out in an Ohlendorf start in 2010. Mr. Wonderful fell to an unreal 1-9 with this latest outing, allowing 10 baserunners in five innings. While it's clear that he has had a lack of run support, his regression this season is a major disappointment. As for that offense, the Pirates have scored a total of two runs in their last four games, and it doesn't help that Pedro Alvarez is mired in a 2-for-28 slump, sitting out each of the past two contests. The only Pittsburgh hits on Monday were singles from Lastings Milledge, Delwyn Young, and Neil Walker. The Buccos will try for a rebound tonight against highly-touted Mike Leake (3.57, 7-2), pitting Paul "He's Still Here?" Maholm (4.52, 6-9) against the Reds. Gametime is set for the usual 7:05 at PNC this evening. The bigger question is will the Pirates sign the top two picks from this years draft? Any news on this front? I haven't heard anything either and i don't really expect to hear anything until the deadline... Does anyone know when the deadline to sign draft picks is anyway? It seems like forever since the draft happened. August 16th. Unless you're a college senior, then you're out of eligibility and they can sign you any time. Don't expect any news until about ten 'til midnight on the 16th. As for what happened "to the Lumber Company," the Bucs are struggling against the best team in the NL (Padres) and the top two teams in the Central (Cincy/St. Louis). It's not like they're getting swept by the Astros. Besides, I kinda hope they finish dead last because the #1 overall pick is an Evan Longoria clone who'll look fabulous in the black and gold. The Reds are building a nice pitching staff there. With Mike Leake doing well, the guy last night Travis Wood almost pitching a perfect game against the Phillies and then that Cuban defector that throws 100....they could be at the start of a nice little run. Like Chip said, August 16th is the deadline and pretty much no impact players will be signed until the last minute on the 16th. MLB doesn't like teams to announce huge over-slot signings before the deadline because they argue it would increase the demands of every other player and make it tougher on teams without a lot of money. It's entirely possible that we've already come to an agreement on Taillon and/or Allie and just haven't been allowed to announce it yet. Which unfortunately also means we haven't been allowed to assign them to the minors yet. Can any one of the kool-aid drinkers explain how Ohlendorf hasn't been moved to the bullpen? I understand that he has rarely had any run support but the guy is always in trouble and puts himself in a hole on a regular basis. I think the problem is that Ross is our best option at this point. I'm pretty sure most people would rather see us parade him out there instead of Charlie Morton and his great stuff. @78: Lack of options. You move Ohlendorf to the pen, who do you start instead? McDonald is probably going to be a starter, but there are worse members of the rotation than Ohlendorf that he could replace (Karstens, D. McCutchen.) It's not that Ohlendorf is good, it's that he's less bad than other pitchers that could start. Also, he really has been getting screwed over with run support. 8 of his 17 starts this year have been quality starts, and that includes 4 of his 8 losses. Again, he's not really a GOOD pitcher, but he's better than his W/L record would indicate.